Edward Morgan Forster (January 1, 1879 – June 7, 1970) was an English novelist, short story writer, and essayist. He is most famous for his novels. Forster is also known for a creed of life which can be summed up in the epigraph to his 1910 novel Howards End, "Only connect." Forster's two most noted works, A Passage to India and Howards End, explore the irreconcilability of class differences. This problem is somewhat mitigated by his use of mysticism, for which he has been criticized. Forster's humanistic ideas recognize the difficulties of overcoming class differences, but he introduces a mystical element to help resolve these problems. Some of his characters, such as Mrs. Wilcox in Howards End and Mrs. Moore in A Passage to India have a mystical link with the past and are able somehow to connect with people from beyond their own circles, reconciling the "irreconcilable" class differences only through a spiritual deus ex machina. Born in London, the son of an architect, he was to have been named Henry but was baptized Edward by accident. Among his ancestors were members of the Clapham Sect, a nineteenth-century group of largely evangelical Anglican social reformers concerned with abolishing slavery and penal reform. As a boy he inherited £8,000 from his paternal aunt, Marianne Thornton, daughter of the abolitionist Henry Thornton, which was enough to live on and enabled him to become a writer. He attended Tonbridge School in Kent as a day boy. At King's College, Cambridge between 1897 and 1901, he became a member of the Cambridge Apostles (formally named the Cambridge Conversazione Society), a discussion society. Many of its members went on to constitute what came to be known as the Bloomsbury Group, of which Forster was a peripheral member in the 1910s and 1920s. There is a famous account of Forster's Cambridge and that of his fellow Apostles at the beginning of The Longest Journey. After leaving university he traveled on the continent with his mother and continued to live with her at Weybridge and Abinger Hammer in Surrey until her death in 1945. His early novels, set in England and Italy, were praised by reviewers but did not sell in large quantities. Howards End (1910) made him famous. He traveled in Egypt, Germany and India with the classicist Goldsworthy Lowes Dickinson in 1914. Doing war work for the Red Cross in Egypt, in the winter of 1916-17, he met in Ramleh a tram conductor, Mohammed el-Adl, a youth of seventeen with whom he fell in love and who was to become one of the principal inspirations for his literary work. Mohammed died of tuberculosis in Alexandria in spring of 1922. After this loss, Forster was driven to keep the memory of the youth alive, and attempted to do so in the form of a book-length letter, preserved at King's College, Cambridge. The letter begins with the quote from A.E. Housman "Good-night, my lad, for nought's eternal; No league of ours, for sure" and concludes with an acknowledgement that the task of resurrecting their love is impossible. He spent a second spell in India in the early 1920s as the private secretary to the Maharajah of Dewas. The Hill of Devi is his non-fictional account of this trip. After returning from India he completed A Passage to India (1924) which became his most famous, most widely-translated, and last novel. Forster wrote little more fiction apart from short stories intended only for himself and a small circle of friends. People have speculated about his decision to stop writing novels at the age of 45. In the 1930s and 1940s Forster became a successful broadcaster on BBC radio. He also became a public figure associated with the British Humanist Association. Forster had a happy personal relationship beginning in the early 1930s with Bob Buckingham, a constable in the London Metropolitan Police. He developed a friendship with Buckingham's wife, May and included the couple in his circle, which also included the writer and editor of The Listener, J.R. Ackerley, the psychologist W. J. H. Sprott and, for a time, the composer Benjamin Britten. Other writers Forster associated with included the poet Siegfried Sassoon and the Belfast-based novelist, Forrest Reid. After the death of his mother, Forster accepted an honorary fellowship at King's College, Cambridge and lived for the most part in the college doing relatively little. In 1969 he was made a member of the British Order of Merit. Forster died in Coventry at the home of the Buckinghams. Forster had five novels published in his lifetime and one more, Maurice, appeared shortly after his death although it was written nearly sixty years earlier. A seventh, Arctic Summer, was never finished. His first novel, Where Angels Fear to Tread (1905), is the story of Lilia, a young English widow who falls in love with an Italian. It details the efforts of her bourgeois relatives to get her back from Monteriano (based on San Gimignano). The mission of Philip Herriton to retrieve her from Italy has something in common with that of Lambert Strether in Henry James's The Ambassadors, a work Forster discussed ironically and somewhat negatively in his book of criticism, Aspects of the Novel (1927). Where Angels Fear to Tread was adapted into a film by Charles Sturridge in 1991. Next, Forster published The Longest Journey (1907), an inverted bildungsroman following the lame Rickie Elliott from Cambridge to a career as a struggling writer and then a schoolmaster, married to the unappetizing Agnes Pembroke. In a series of scenes on the hills of Wiltshire which introduce Rickie's wild half-brother Stephen Wonham, Forster attempts a kind of sublime related to those of Thomas Hardy and D.H. Lawrence. Forster's third novel, A Room with a View (1908) is his lightest and most optimistic. It was started before any of his others, as early as 1901, and exists in earlier forms referred to as 'Lucy'. The book is the story of young Lucy Honeychurch's trip to Italy with her cousin, and the choice she must make between the free-thinking George Emerson, and the repressed aesthete, Cecil Vyse. George's father Mr. Emerson quotes thinkers who were influential on Forster including Samuel Butler. A Room with a View was filmed by Merchant-Ivory in 1987. Where Angels Fear to Tread and A Room with a View can be seen collectively as Forster's Italian novels. Both include references to the famous Baedeker guidebooks and concern narrow-minded middle-class English tourists abroad. Many of their themes are shared with some of the short stories collected in The Celestial Omnibus and The Eternal Moment. Howards End (1910) is an ambitious condition of England novel concerned with different groups within the Edwardian middle classes represented by the Schlegels (bohemian intellectuals), the Wilcoxes (thoughtless plutocrats) and the Basts (struggling lower-middle-class aspirants). A feature frequently observed in Forster's novels is that characters die suddenly. This is a feature of Where Angels Fear to Tread, Howards End and, most particularly, The Longest Journey. Forster achieved his greatest success with A Passage to India (1924). The novel is about the relationship between East and West, seen through the lens of India in the later days of the British Raj. In it, Forster connected personal relationships with the politics of colonialism through the story of the English Adela Quested and the Indian Dr Aziz and the question of what did or did not happen between them in the Marabar Caves. Maurice (1971) was published after the novelist's death. It is a homosexual love story which also returns to areas familiar from Forster's first three novels such as the suburbs of London in the English home counties, the experience of being at Cambridge, and the wild landscape of Wiltshire. Forster's views as a secular humanist are at the heart of his work, which often features characters attempting to understand each other, in the words of Forster's famous epigraph, across social barriers. His humanist views are expressed in the non-fictional essay What I Believe. Forster's two most noted works, A Passage to India and Howards End, explore the irreconcilability of class differences. Although considered by some to have less serious literary weight, A Room with a View is also notable as his most widely read and accessible work, remaining popular for the near century since its original publication. His 1914 novel Maurice, published posthumously in 1971, explores the possibility of reconciling class differences as part of a homosexual relationship. Sexuality is another key theme in Forster's works and it has been argued that Forster's writing can be characterized as moving from heterosexual love to homosexual love. The foreword to Maurice expresses his struggle with his own homosexuality, while similar themes were explored in several volumes of homosexual-themed short stories. Forster's explicitly homosexual writings, the novel Maurice and the short-story collection The Life to Come, were published shortly after his death and caused controversy. Collected Short Stories (1947) — a combination of the above two titles, containing: "The Story of A Panic," "The Other Side Of The Hedge," "The Celestial Omnibus," "Other Kingdom," "The Curate's Friend," "The Road From Colonus," "The Machine Stops," "The Point Of It," "Mr Andrews," "Co-ordination," "The Story Of The Siren," "The Eternal Moment"
The Life to Come and other stories (1972), (posthumous) — containing the following stories written between approximately 1903 and 1960: "Ansell," "Albergo Empedocle," "The Purple Envelope," "The Helping Hand," "The Rock," "The Life to Come," "Dr Woolacott," "Arthur Snatchfold," "The Obelisk," "What Does It Matter? A Morality," "The Classical Annex," "The Torque," "The Other Boat," "Three Courses and a Dessert: Being a New and Gastronomic Version of the Old Game of Consequences," "My Wood"
Brander, Lauwrence. E.M. Forster. A critical study. London, 1968. Martin, John Sayre. E.M. Forster. The endless journey. London: Cambridge University Press, 1976. ISBN 9780521290821. Mishra, Pankaj (ed.). "E.M. Forster." India in Mind: An Anthology. New York: Vintage Books, 2005. All links retrieved October 4, 2017. 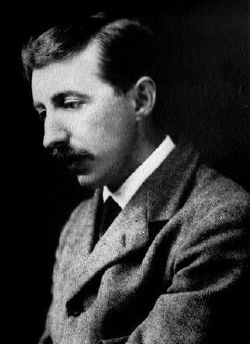 History of "E. M. Forster"
This page was last modified on 4 October 2017, at 15:32.